We moved to our present location, thirty miles north or Phila., in 1975....... we had lived in town previously, and both felt we were missing something..... from our open bedroom window, we could hear cows lowing, on the farm about a half mile, as the crow flies, from our house. When the landlord put the house on the market, we began looking for a place to buy.... and came across this place. I had worked it out on paper, and knew we would be able to afford this on only one salary, if need be.... so we bought it. Both our nearest neighbors are farmers..... and their fields completely surround our little acre on three sides... with the farms, themselves, at waving distance. Five years later, Harold decided we needed a barn.... to house his growing collection of antique equipment..... so he and his dad, Elbert, and Wayne, our then teenage son, built our barn with lumber that they salvaged from several other barns that were being dismantled........ it added a touch of history to the building. Harold also decided, that we should put a small stable into the barn and have some sort of animal..... Our little acre did not pass the township requirements for an equine of any kind..... so we thought about sheep.....both that got nixed by both of us...... we'd had enough of them when we first married and lived on his grandmom's farm. That is when we thought of a couple of dairy goats.... just for pets..... and started visiting various farms to check out the different breeds.... We settle on an Alpine doe kid, whom I named Snowflake..... and a Toggenburg wether, that we named Buck-it. Unfortunately, we lost Buck-it about five weeks later.... to CAE Encephalitis..... and replaced him with a Togg doeling, named Bunny. When they were yearlings, Harold thought he should breed them, so they could pay their keep with milk for the family. Well, that was the beginning....... after several years of just having backyard goats, we tried to breed up to better the type.... and leased a buck from a reputable breeder... for the the winter. Now Harold thought he would like to show his beautiful goats... and found out what it took to place well in the show ring....... He tould everyone that all he wanted was the last ribbon that was handed out in a class...... and when he got that..... he began wanting blues..... At this point, I started taking an interest in the breeding aspect of the goats...... and started researching bloodlines..... We, shortly thereafter, purchased our first buck... *B Earth Dance Terrific Future. Terry, as we called him, was with us for three years.. during which time he produced one daughter..... and then went sterile.... and into the freezer. Since shows are a major source of advertising, we try to get to a reasonable number each year. I had set some goals for our herd, and am very pleased that we have fulfilled many of them... We have had a does place Best in Show consistently........ have had a couple of Colorama Does....... have had a doe accepted for Spotlight Sale in 1995..... and have had a doe kid accepted for National Raffle Kid at the 1996 National Show. We pride ourselves, that we are continuing to produce the best animals we can.... using genetics from some of the most consistent bloodlines we can find..
We got our first couple pigs, when milk production began to exceed the amount needed to raise kids. Since I am a very practical person, I could not see the sense in just dumping the unused milk. That year we only raised two, as a trial..... one for ourselves and one for sale. We now raise two sets of three or four pigs a year. The first set is started from weanlings, about the time our first batch of kids are a couple weeks old. 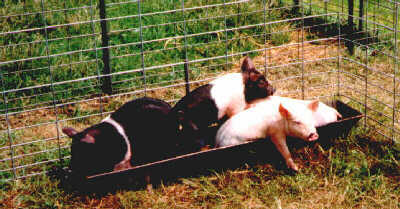 The piglets are about twenty-five to thirty pounds at that time, and do not require very much milk. As the kids grow toward weaning age though, they get less milk and the pigs get much more. By the time the kids are all weaned, the pigs are getting about five gallons each, every day. 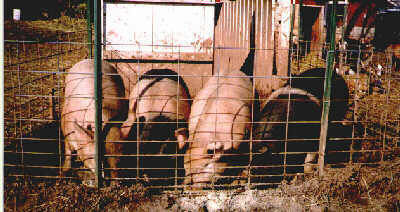 The pigs are usually ready to go at about twelve to thirteen weeks. After the first set are gone, we clean the pen and get another set of weanling pigs. These will be ready to sell as soon as deer season is over in December. We sell our pigs alive, and deliver them for the new owners. The pigs are sold private, through word of mouth, and we charge by the pound for them....live weight. Most of our buyers have their pig delivered to a local custom butcher for processing. There is a certain amount of extra work involved with raising the pigs, but the money from selling them comes in at just the right times..... mid summer for buying hay, and mid winter for paying feed or vet bills. All in all, it is a good combination, and helps to support our goats.